By the Sea was written and directed by Angelina Jolie. 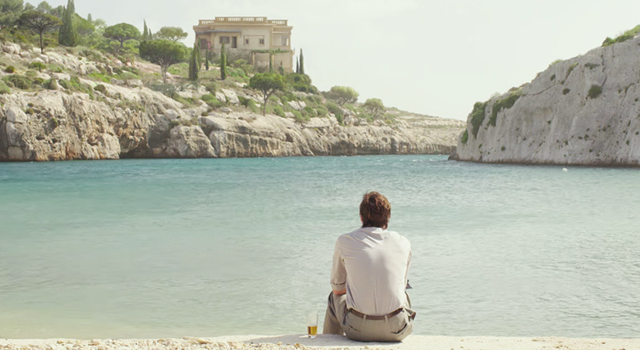 The movie follows a couple who are going to vacation in the south of France (which is actually filmed in Malta) and is gorgeous by all accounts. The cliffs, the hotel, the color of the sea, the way that people move and how they are dressed was done very well. It’s actually less of a holiday than an excuse to go somewhere beautiful and write a little bit, to prove he is a successful writer when he actually feels like an imposter. It’s where Roland (Brad Pitt) is trying to become inspired again after some personal tragedy that is alluded to but not actually spoken about. Turns out, he has a love of the drink as well. They sweep into their hotel room and move things around, setting up the red typewriter that will record a story of some sort. Vanessa (Jolie) has brought several hats with her to walk along the cliffs and stare out into the blue sea, watching a fisherman every day. Time is an illusion in this film as the same things happen every day. We know that Vanessa is depressed and you can tell that because she doesn’t smile at all , she just reads her book. She languishes in the sun, spies on other people, and appears to be just a fragment of a human being. Her beauty is still evident but it’s in a soul crushing way. I was actually quite intrigued by her in this film. Usually I am not a fan of Jolie. Roland is less than sympathetic to her position. There’s another couple who enters the scene and in a strange way serves as the inspiration for Roland’s book that he’s trying to write. To tell you more would be to spoil the film and, in general, the viewer isn’t told details until close to the end of this two hour movie (which can feel longer). Roland likes to drink at the cafe and is told by a wise Frenchman that he should love his wife. That’s advice. It’s strange to think that this story all came out of Angelina Jolie’s head. The dialogue was pretty tedious and uninspired but the visuals helped it immensely. It’s as if she was trying to recreate something timeless, since it is set in the 70s and is set in France, but ultimately whenever they speak with their American accents, it pulls one right out of the film. For all the beauty of the setting, the actual meat of the story doesn’t really go very far and can give you the impression that it’s deeper than it really is. It’s trying to show the other side of the iceberg but all we get is the bit sticking outside of the water that is easily ignored.